We’re here to help! If you don’t see your question answered below, drop us a line at info(at)forecastlefest(dot)com. We do not accept unsolicited music submissions at any point in the year, and those sent to this address will not receive a reply. Please note that the FAQs listed below apply only to Waterfront Park and the Forecastle Festival. When and where does Forecastle take place? Forecastle 2019 takes place July 12-14 in Louisville, KY at the stunning Waterfront Park. Small backpacks and purses and empty hydration bladder packs. Large backpacks, book bags, or any bag that is over 12”x 6”x 12” in size will not be allowed. Selfie sticks are allowed, but must expand to no longer than 40″ in length and must be made of light material (light metal, rubber plastic.) All selfie sticks are subject to Forecastle staff discretion and may or may not be allowed. REMEMBER: All travelers and their belongings are subject to search and prohibited items will be removed at the discretion of the front gate and security staff. Large backpacks, book bags, or any bag that is over 12”x 6”x 12” in size will not be allowed. No solicitations, handbills, sampling, give-aways, etc. REMEMBER: All travelers and their belongings are subject to search and prohibited items will be removed at the discretion of the front gate staff. These items are subject to change at anytime and at the discretion of the front gate and security staff. Visitors with a General Admission Weekend Pass, Yacht Club Weekend Pass, and VIP Weekend Pass will have re-entry privileges. General Admission Single Day Ticket holders will not be allowed re-entry. There is plenty of street parking and many open lots near Waterfront Park. Please click here for a map of parking lots, or visit our Transportation page. Pay attention to signage and park only in areas where public parking is permitted. The Forecastle Festival is not responsible if your vehicle is towed or ticketed. We encourage you to ride a bike! It reduces your carbon footprint, provides great exercise, and allows sustainable transport. We will have a complimentary bike valet service available outside the secondary entrance on the southwest side of the park. Walking and public transit are also encouraged. Click here to learn more. Please travel safe and enjoy the festival responsibly. We want to make sure you make it home safely! I'm a new mother, can you accommodate me? Forecastle Festival has a Lactation Station for new mothers. You should have no issues getting through security with your gear. If needed, mothers will be given a re-entry wristbands so you can store any bottles and supplies in your car. If a new mother is staying in a hotel farther away, they are allowed to bring a small soft-sided cooler to carry with them. The Lactation Station is the go-to for new moms and their little ones! Is this event family friendly? We are certainly a family friendly event and welcome guests of all ages. Children under 6 will be admitted for free with an adult admission. What time do gates open each day and when does the music start / end? Door times and the full festival schedule will be released closer to the event. Is there a map of the festival? Yes! You can view it here. Will there be ATMs available? Yes. If you need cash, ATMs can be found on the festival grounds. Yes! The Forecastle mobile app will be available closer to the festival and will be your go-to source for the latest information including set times, maps, and more. What should I expect during the buying process? From our tickets page, the “buy ticket” links will take you to our ticketing site hosted by Front Gate Tickets. Front Gate handles all things associated directly with your purchase order including customer service for things like payment, order changes, wristband shipments, etc. Create An Account: When you add a ticket to your cart, you will be prompted to create or sign into a Front Gate Tickets account. This is required and is the account you will need to log in to if you ever want to review or update your order. It’s a good idea to create a Front Gate Tickets account ahead of time if you are buying at a busy time and want to be able to move quickly. Time Limit: Once you cart a ticket, you will have a limited time to finish checkout. So be sure you know what you want before going in. This is done to make sure that everyone has a fair chance at the limited ticket volume and nobody can hold onto them indefinitely without purchasing them. Layaway Plans: Near the end of the checkout process you will have the option of splitting your order into multiple payments. This can be done to any order and will split your ENTIRE oder cost based on a percentage. Customer service and getting prompt help: Your best contact for ticketing related support is Front Gate Tickets. They can also be reached by phone at 888-512-SHOW (7469). Do you offer a layaway plan for purchases? YES! On the checkout page, you have the option to purchase your full order at that time or you can purchase using a “layaway plan” for a non-refundable nominal fee of $10. This layaway plan applies to everything in your cart at checkout – not just your tickets. Purchaser must agree to the Layaway Plan Terms & Conditions, including a default policy. You may also choose to pay your layaway plan in full. Find details on how to do so here. Layaway plan fee and shipping will be paid with the first deposit and will not affect the percentage paid for each installment. What is the difference between the general admission price levels? There is no difference between the general admission price levels. It’s simply an incentive to purchase sooner rather than later. The earlier you buy, the more you save! VIP details are available on our ticketing page. If I bought a weekend pass or daily ticket, am I automatically admitted to the late-night shows? These are separately ticketed events. Capacity for these events is very limited, so be sure to make plans early. Do you offer single day tickets? Yes, Forecastle offers single day ticket options. Single day tickets go on sale Thursday, April 11th at 10AM ET. View ticketing options here. Once you have placed an order through Front Gate Tickets, visit https://forecastle.frontgatetickets.com/ and click “sign in” at the top of the page. Once signed in, you can check your order and adjust account information. Tickets will be delivered by mail or email from Front Gate 2-4 weeks prior to the festival. The delivery method is dependent on the option you selected when purchasing. Questions about an order already placed? Yes! If you’ve already purchased tickets and need to change your shipping address, want to know the status of your order, look up your order history, or have a general question about your order, please contact our official ticket provider Front Gate Tickets or call 888-512-SHOW (7469). Is it ok to buy from a third party? Only wristbands purchased through the Forecastle ticket website (Front Gate Tickets) are guaranteed to be authentic. If you want 100% confidence in your ticket purchase, you should only purchase your tickets through the link on our tickets page. We are not responsible for any counterfeit weekend passes. For your own protection, please do not purchase weekend passes from any source other than forecastlefest.com or your most trusted friends and family. Removing a wristband automatically voids it (unless by accident or for safety reasons, in which case you need to get a replacement wristband from a customer service booth at the festival – this will require you to prove your purchase information). Festival Security will check every wristband to assure it has not been removed or passed between multiple people. Tickets will be delivered by mail or email from Front Gate 2-4 weeks prior to the festival. The delivery method is dependent on the option you selected when purchasing. You will exchange your ticket for a wristband at the festival gates. If you have not received your tickets(s) 72 hours prior the start of the festival, please contact our ticket provider, Front Gate Tickets or call 888-512-SHOW (7469). Each ticket buyer to Forecastle will receive a high security wristband with a uniquely coded RFID (Radio Frequency Identification) chip embedded inside. Every wristband will be scanned as you enter & exit the festival site. Each package shipped will include detailed instructions on the proper procedure for using your Forecastle wristband. It is important that you read these instructions and follow them exactly. Failure to follow these instructions may result in you not being admitted to the festival site. At the festival, if you have any questions or problems regarding your wristband, visit one of the Wristband Customer Service stations where a staff member can help you. Station locations will be clearly marked on your festival map. Wristbands are non-transferrable. One wristband per person. Each individual accessing the event must have their wristband registered and on the their wrist at all times. The Box Office is located on E. Witherspoon Avenue to the left of the East Entrance. View the festival map here. Yes, please contact our ticket provider, Front Gate Tickets or call 888-512-SHOW (7469). Can I update or check on my order information? Yes! Once you have placed an order through Front Gate Tickets, visit https://forecastlefest.frontgatetickets.com/ and click “sign in” at the top of the page. Once signed in, you can review or adjust information like your shipping address, cashless account, etc. Can I purchase individual drink tickets to the Bourbon Lodge™ in advance? No, individual drink tickets will only be available on site at the Bourbon Lodge™. Full memberships are the only option available for purchase in advance. Learn more here. What delivery options do I have when purchasing a Bourbon Lodge™ membership in advance? If you purchase your Bourbon Lodge™ membership along with your Forecastle festival ticket, your membership voucher will be set to the same delivery method as your festival ticket. For example, if you chose to have your festival tickets mailed, your Bourbon Lodge™ membership voucher will also be mailed to you. If you purchase your Bourbon Lodge™ membership separately, you will be able to choose your delivery option (print at home, mail, or shipping). Regular per order delivery charges will apply. Bourbon Lodge™ Members are able to redeem their vouchers starting Thursday prior to the event at the Louisville Visitors Center. How do I redeem my Bourbon Lodge™ Membership voucher for my mug and drink tickets? Bourbon Lodge™ Members are able to redeem their vouchers starting Thursday prior to the event at the Louisville Visitors Center and on site at the festival at the Redemption Tent. Do you offer special hotel rates? Yes! Check out our exclusive Forecastle hotel rates here. Forecastle does not offer camping on-site, but Jefferson Memorial Forest offers camping 15-20 minutes from downtown Louisville. Just inside the West Entrance to the festival grounds near the Information Booth will be the Access Center. There you can find maps identifying the restricted viewing areas reserved for patrons with disabilities (plus one companion). The space in these viewing areas is limited however and will be available on a first-come, first-served basis. Also found at the Access Center are large-print programs as well as one printed in Braille. A power outlet will be available for recharging power wheelchairs. There will be slightly elevated, restricted viewing areas near the Mast and Boom stages for people with mobility limitations and/or those who require a sign language interpreter. Stop by the Access Center to pick up the specially identified Access wristband that will allow a patron with a disability plus one companion access into the viewing areas. Please note: having a wristband does NOT guarantee entry to the viewing areas. Space is limited and will be available on a first-come, first served basis. When capacity is reached the viewing areas will be closed and no one else will be allowed entry. Seating is mandatory in the viewing areas to allow a clean line of sight for everyone. Chairs will be provided on a first-come, first-served basis. Please cooperate with festival staff if asked to make room for additional patrons. There is no smoking in the viewing areas and no saving of seats. Any violation of these policies can result in immediate expulsion from the viewing areas. The festival is held outdoors in a park. There will be a lot of natural terrain to travel over and if it rains it could become muddy. There are sometimes great distances between stages. Personal assistance, wheelchair pushes, and any type of transportation, including golf cart rides, are NOT provided by the festival. If you require any additional assistance please plan on bringing a companion. Wheelchairs are not available for rent or loan. Wheelchairs, power wheelchairs and small three or four-wheeled scooters are allowed in the festival. Other power-driven devices will be considered only on a case-by-case basis. A power device should not move faster than a person can walk and extreme care needs to be taken when operating such devices due to the large crowds expected at the festival. Therefore, large, fast and heavy mobility devices are not appropriate in this situation. Accessible portalets can be found at the end of each row of portalets. Forecastle Festival has an American Sign Language (ASL) team available. Some main stage (Mast and Boom) shows will be interpreted. Because it takes quite a lot of time for interpreters to study and practice the music, please send specific requests to us as soon as possible at [email protected]. Please include your cell phone number in the request. Please note we will do our best to accommodate requests but cannot guarantee anything. During the event, stop by the Access Center to see the entire interpreter schedule and get more information. Pets are NOT allowed at the festival; however, service animals, which are trained to provide assistance to a patron with a disability, are welcome. The owner of the animal may be asked what service the animal provides. If you have a service animal, please use the west entrance and alert security when you arrive. Once security is alerted, you will be directed to the access center to fill out a notice of responsibility for your service animal. If a patron has a special dietary restriction, those items will be allowed onto festival grounds if accompanied by a doctor’s note. Any medically necessary medicine and materials must be in the name of the patron. Your ID will be matched with the label on the items brought to the festival. Please dispose of any medical waste and syringes at the First Aid stations found around the festival grounds. Please do not dispose of them in trash bins. There is no parking on-site. However, street parking and public parking lots including accessible spaces are nearby. 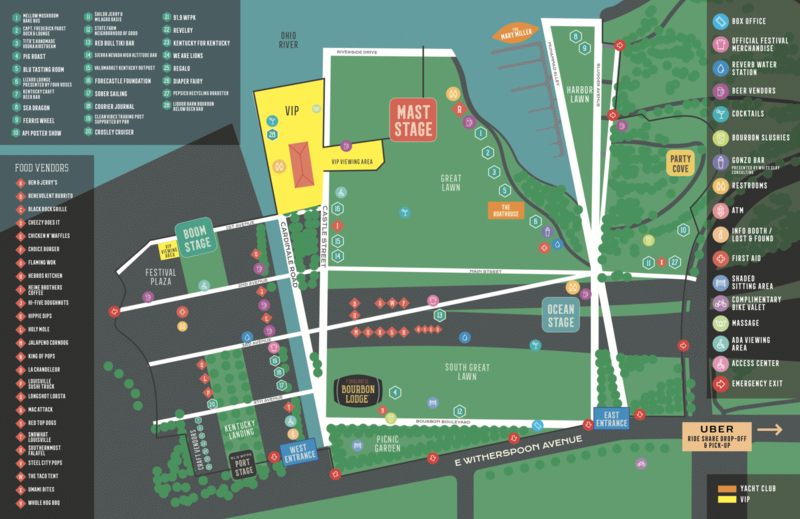 Please check the Louisville/Transportation tab on the Forecastle Festival website for a map of parking lots. Please feel free to contact [email protected] with any other questions you may have. We’re looking forward to see you at the festival! There are daily shuttles available from several locations around the venue, such as: Bloomington High, Carmel, Columbus, Cincinnati, Lexington, Louisville Airport Hotels, Nashville, Indiana University, Indianapolis, West Chester Township. Does Forecastle have a bike valet? Yes! Forecastle provides all festival patrons access to a complimentary Bike Valet for those cycling to and from the festival. It is located on E Witherspoon Avenue across from the East entrance. What are the safety and medical procedures? If you need medical attention, we will have two medical tents located on-site as well as a medical team at both the Mast stage and Boom stage. If you can’t make it to one of the medical tents or team, grab an event organizer or member of our security staff, and we will assist you. It’s important to us that everyone take good care of themselves. Please make sure to eat good healthy foods and drink lots of water! All that dancing can take a lot out of you, so take a break if you don’t feel well. Please see an in depth look at out festival safety policies and procedures here.